No one seems to accept this as a possibility yet but Labor may well have won the next election today. Everyone does agree the Federal Government has been through the most extraordinary two weeks of bloodletting – not so much airing its dirty linen in public as proudly wearing it at a fancy dress party. From Simon Crean’s early promptings, to the mysterious airing of Rudd’s sweary video, the revelations of the Four Corners program of what Gillard did and did not know, Rudd’s overseas midnight resignation, the ferocious response of Government Ministers and Gillard’s ultimate triumph today, it has been gift-wrapped coverage for our media. Hundreds of journalists were in Canberra today for the vote which was a foregone conclusion. Yet none of them picked up in advance the biggest story of the day – the resignation of Mark Arbib. It shows the length Labor may be prepared to go to kill the leadership debate and end the political drama. Along with fellow minister Bill Shorten, Arbib was behind that drama – the ultimate face of the faceless men who deposed Rudd in 2010. With senior minister Nicola Roxon admitting on the weekend she was unaware of the impending coup, it was Arbib and Shorten who Rudd considered the backstabbers-in-chief. Given he has not forgiven the party for his sacking, it is not beyond the possibility Rudd demanded a faceless head as his price for supporting Gillard post ballot. Arbib’s confusing resignation statement hinted there was something stronger than the “family reasons” offered as the main cause. As a Senator he could leave without Labor facing a by-election. Meanwhile Kevin Rudd seemed at ease after the ballot today. Perhaps he has exercised some of the demons of his 2010 defeat which occurred without a ballot. The initial reports were that he had just 29 supporters in caucus but it was soon revised to 71-31. This was a margin that seem to please everyone in Government. Gillard was handsomely re-elected with over a two to one majority. Rudd was not disgraced (those two missing votes getting him into the respectable thirties) without getting the 40 or so votes he needed for the legitimacy of a second challenge to the leadership. His speech afterwards was both valedictory and apologetic. He stood up for a belief in his achievements but acknowledged others saw it differently. Most importantly he committed to Gillard for the life of her Government, effectively ending his leadership challenge until she retires or is beaten at the polls. This was also a coded message to the media: he was off the drip. With no other senior minister with a serious axe to grind, there should be few further leaks of the kind that has destabilised the Gillard regime from the moment it took office. The media will keep Rudd on the preferred prime minister poll question as they do Malcolm Turnbull. But just as with Turnbull, Rudd leadership stories will run short of juice without a quote from a “Senior Government Minister”. The similarities with Turnbull extend beyond this. Both men are brilliant intellectuals but brittle and difficult to work with. Both have probably burned their bridges with their caucus colleagues and may have to set up a third (or fourth) party if they are to ever re-establish their leadership credentials. Rudd in particular is damaged goods. The Australian hailed him as Labor’s best hope to defeat the Coalition in 2013, but his clear lead in the preferred prime minister stakes was in stark contrast to the respect he held from the vast majority of caucus members. It is the difference between having to vote for him and having to work for him. Rudd has mastered a media image of the socially incompetent nerd. It doesn’t appear to matter to voters he hasn’t a shred of genuineness in him as long as he has that smile to crash or crash through any awkwardness. Behind the scenes, other parts of his personality were free to do their ugly work far from public prying. 24 x 7’s Kevin’s obsessive desire for control, glass jaw and an enormous untrammelled ego led to an unhealthy work environment. While the self-styled “K Rudd” now sits chastened on the naughty back bench, Prime Minister Gillard seemed ebullient post-ballot. The all-out attack strategy was risky but necessary to kill off her challenger. She has given Abbott his election ads but they will probably be lost anyway in a tasteless and bland stew of negative messages. She also fended off Abbott’s Question Time attack today with ease making him look like a carping yesterday’s man while she was the forward looking leader. Such decisiveness may not last but it at least she can now attack without having to watch her flanks. These two weeks have told us where the corpses are buried but the public is not bothered by the macabre spectacle. Labor got its best result in 12 months in the latest Newspoll today. The two party preferred is 53-47 to the Coalition which is in the margin of error for 50-50. The punters don’t seem to mind the blood-bath when they can see exactly who is throwing the punches. It is also a reminder of the old mantra that when it comes to a vote “It’s The Economy, Stupid”. The Coalition remains all over the place in its economic policy in a time when Australia is in a relatively good position. Abbott’s policy-free zone was a safe bet only as long as Labor continued killing each other. Gillard’s win may not yet have given her clear air, but the fog of war has just got a little less dense. If I thought yesterday was a crazy day, then it was clear I’d aint seen nothing yet. 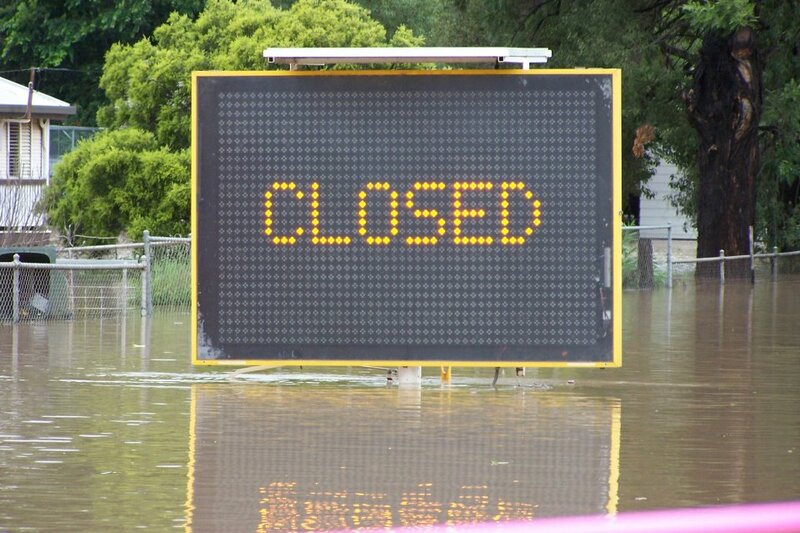 As of yesterday evening, Mitchell was in a bad way and Roma was predicted to get moderate flooding. This was before it rained all night across the west. Text alerts were sent out at 5am to say the situation was worsening in Roma but I didn’t get it as the Victorian-designed system is based on billing address and my bills go to Brisbane. I got up at 6am and set off to check out the water. I arrived at Charles St Bridge over the Long Drain (extension of the Bungil Creek) in time to watch police close it. The creek was 6.6m and rising. I went into the 7am Disaster Management Group meeting where the BoM predicted a height of 7.5m for the Bungil. This meant major flooding on a par with the April 2011 event where 50 houses went under but nowhere near the 8.1m catastrophe of March 2010 when over 200 houses were inundated. Mitchell was still bad after last night with 400 people in shelters. I went out to have a look for myself, not confident the BoM was right. There was a lot of water in the flooded area already, sandbagging was proceeding furiously and I was hearing of massive falls in the catchment. My experience of watching Roma going under, now six or seven times (I’ve lost count) in two years, told me this was bad given there was a lot of water to come. Many people in the flood zone seemed to agree and most were scrambling to move belongings to higher ground. 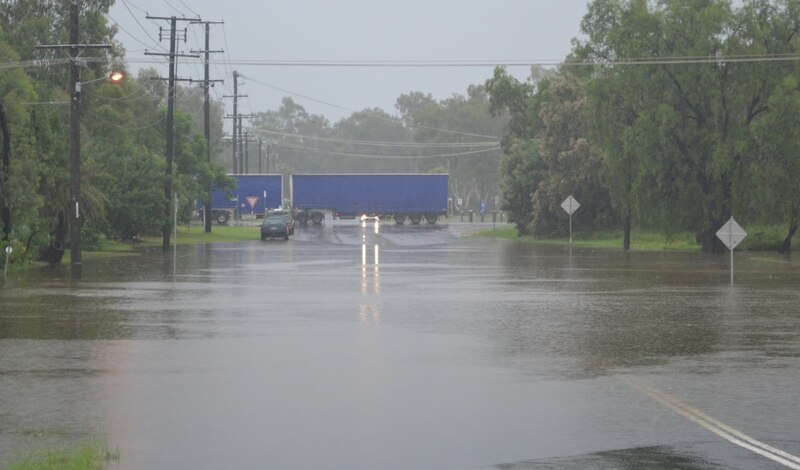 There were a lot of roads cut off and as I drove back to the office I heard the BoM tell the ABC, the new prediction was 8.1m – exactly the same as 2010. This was a disaster in the making. Worse was to come at the office. 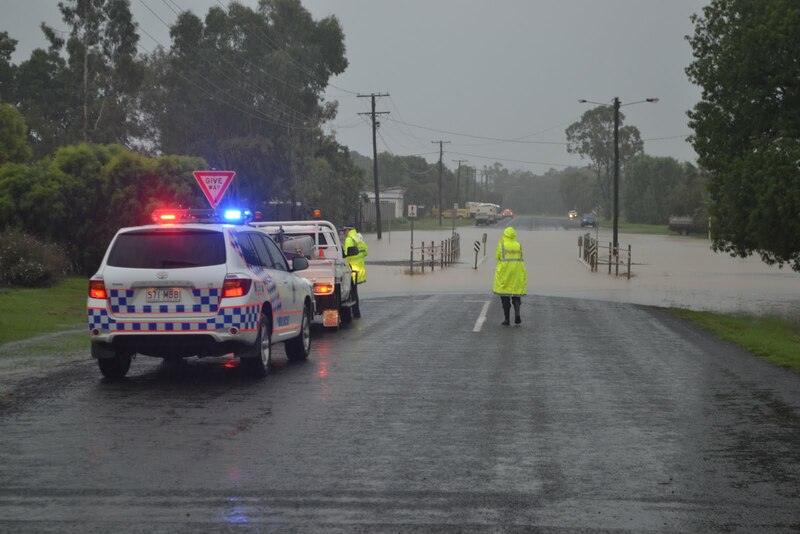 I heard from the Toowoomba Chronicle scanner a woman and child had been washed off the Northern Road. I immediately drove as close to the scene as I could get. I parked my car and watched as fire trucks rushed away from the scene. I hitched a lift through the flood and rang back to the office for them to collect the car. I was worried it would go under and I would not be able to get back in time. When I got to the scene of the accident I asked eye-witnesses what they knew. I eventually found people who saw the whole thing. A woman and her son tried to drive through the floods to get to the Northern Road. Onlookers waved at her frantically to get her to stop. It was too late, the car flipped and the woman and son were washed out of the car. I was told they were both rescued and made my way back through the floods to town. It wasn’t easy. I fell over ruining a work camera which got saturated. I posted my third or fourth web update of the day to say the pair were rescued only to immediately find out my information might not be right. Someone I know rang up frantic to say the woman worked at her place and asked what I knew. I thought she was safe but that wasn’t what she was hearing. I rang the police but they say they were “still getting to the bottom of it.” I had a cold feeling I was wrong. The creek was still rising. I went out again only to drop a second camera in the rising waters. Surely this was greater than 8.1m? At 4pm I attended another Disaster Group Meeting. 8.5m was the new prediction which was “uncharted territory” in the scary words of the BoM expert. Police also confirmed the woman was still missing (as was the car) but the son was safe. They were calling off the search as the number of urgent calls went crazy. With a sick feeling, I went back to the office to retract my earlier version of the story before heading out again. The flood boats were still taking people out of the danger zone. Now the water was coming down McDowall Street where all the shops were. This didn’t happen in 2010. Water was lapping the fire station and businesses were sandbagging. Water still had to come down from upstream and it was still raining. Where would it all end? The creek finally peaked at 8.5m. With the worst over it was time to hit the recovery centres. There were two. 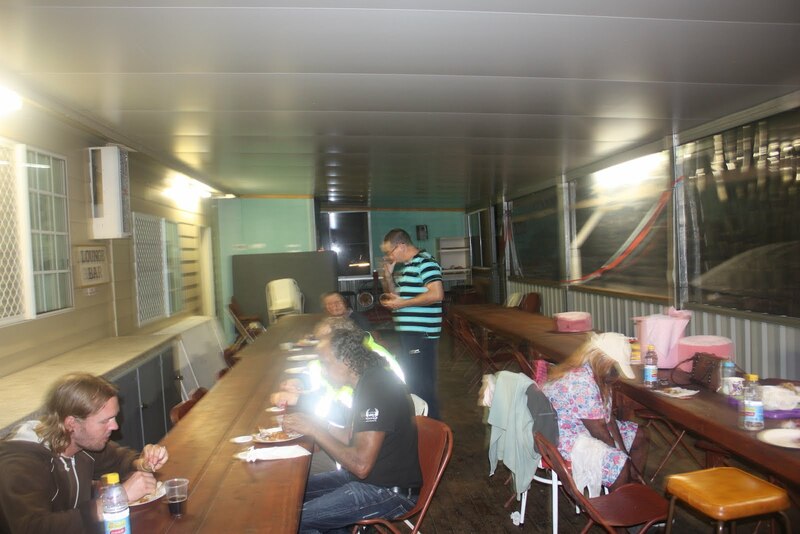 The Rec Centre was where everyone could sleep and the RSL Hall where people could eat. People were tucking into KFC provided free by the local store. I remembered how hungry I was and joined the party. Back on the street, emergency services were mopping up for the night. 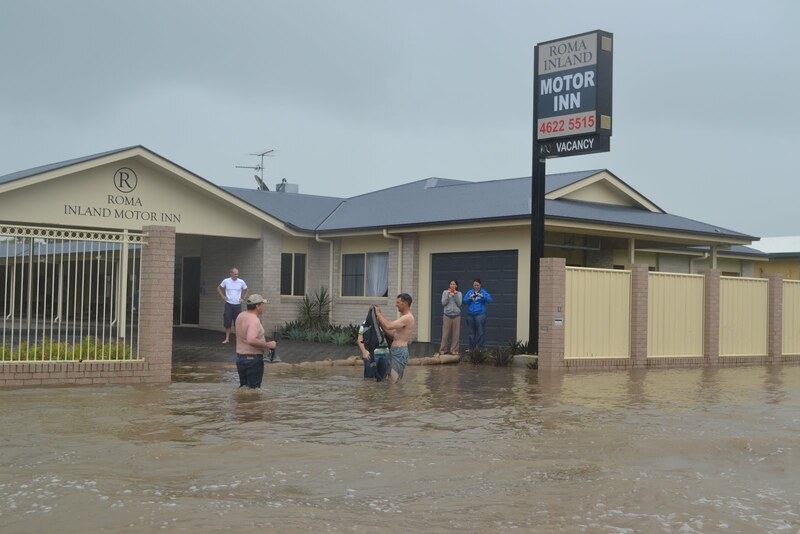 There were still some who needed help like 10 people stuck on the roof of the Overlander Motel. 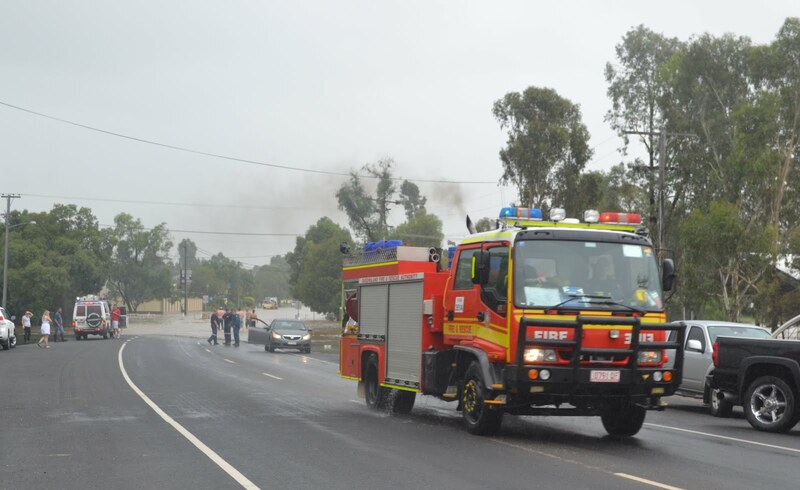 Charleville and Mitchell were still in crisis and Roma had now joined it. Surat and St George downstream will face the music next. The one bright moment of a horrible day is when I bumped into Nev Clem. 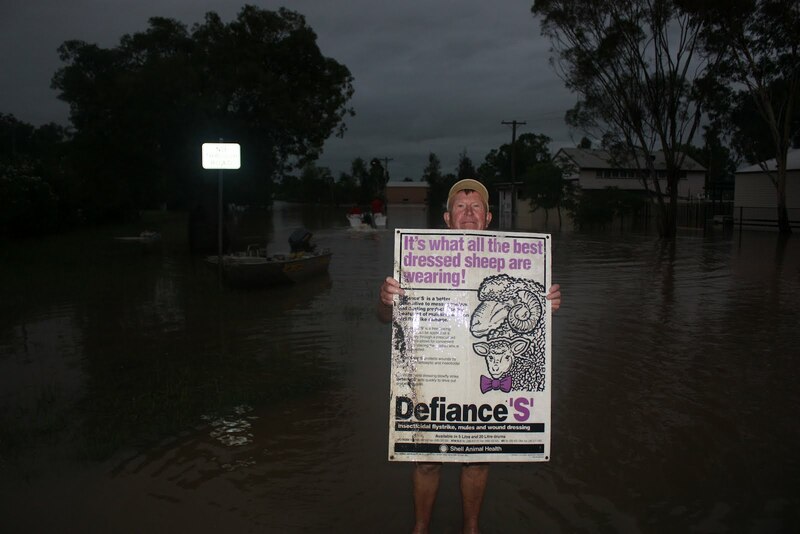 Nev found this poster in the flood zone. Did I want it, he asked. No, but I want your photo, I said. Nev obliged showing Defiance to the world. It will be a quality Roma and western Queensland will need in abundance in the difficult days ahead. 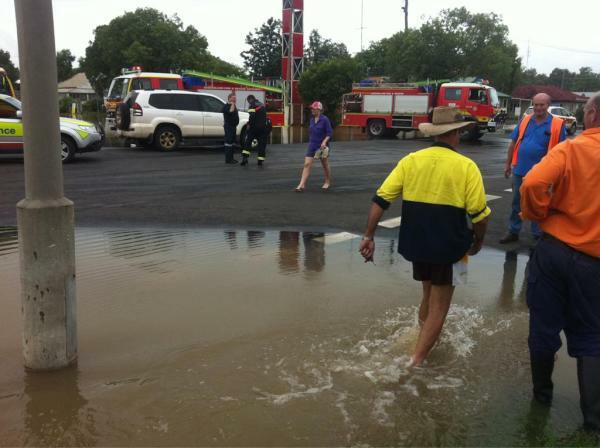 Huge rainfall totals have cut off Mitchell, 90km west of Roma (570km west of Brisbane). The situation is worse than 1990 and getting close to the 1956 record flood. Unlike the big commercial TV stations such as Channel 10 I did not have the luxury of a helicopter to check it out (landing apparently contrary to local council directions). I was in Roma running a solo operation trying to put out the following day’s paper, attending disaster management group meetings, trying to get a sense of what was going on through discussion on our Facebook page and updating our webpage with new information during the day. We got some great pictures, through Facebook contacts. 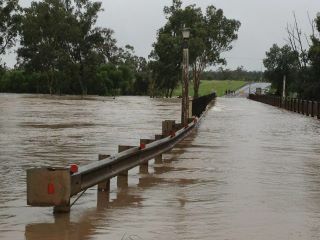 First, by contrast, this is the Maranoa River at Mitchell last Saturday, looking east towards Roma. I took this photo when I though the river was swollen. But it was nothing compared to how it looked today. 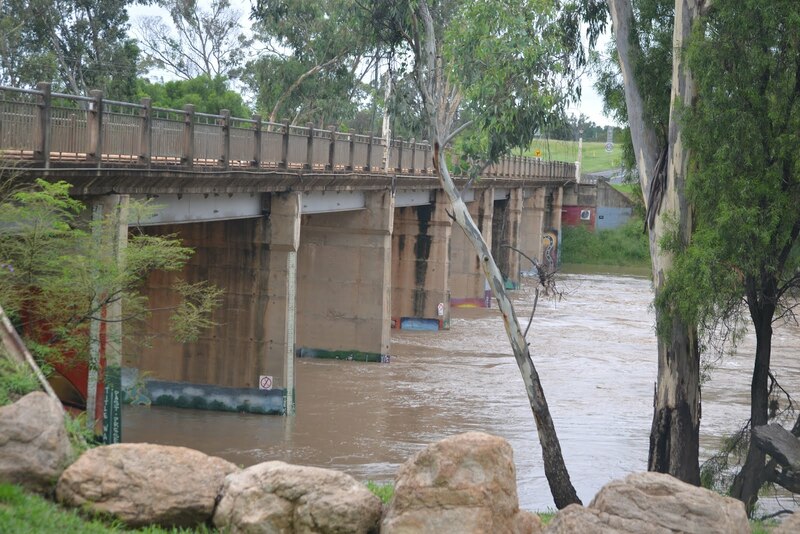 This second photo was taken by Jamielee Dodd in Mitchell around 8am today looking east to the bridge across the swollen Maranoa River. This next one is by taken by Katrina Henry around the same time, 8am but from the other side of the bridge looking back to Mitchell. 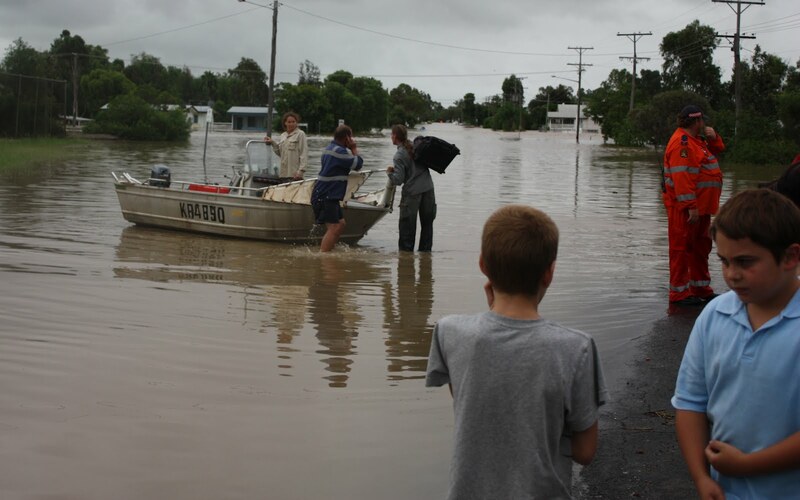 The river was at 8.2m at the time – around the same height as the 1990 flood. This one is from Deb Maiore taken at 9am at the bridge. 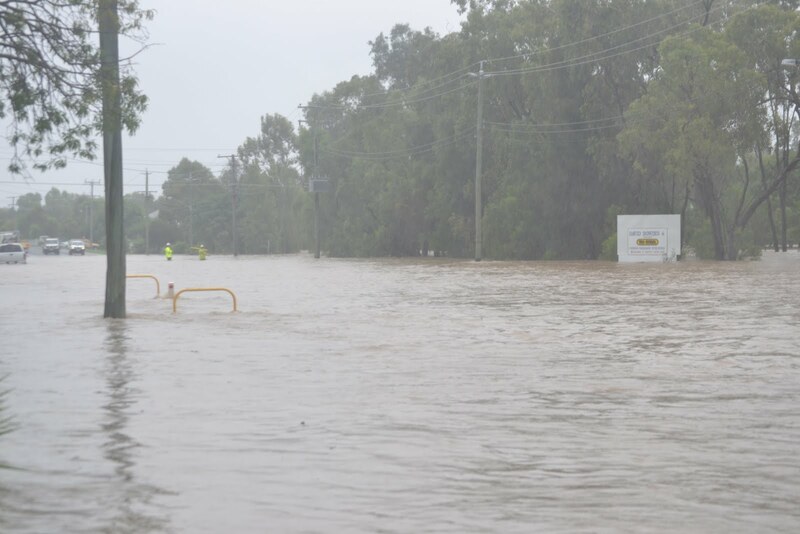 With water still coming down from Currawong, 4 hours upstream, the State Government declared Mitchell a disaster area. 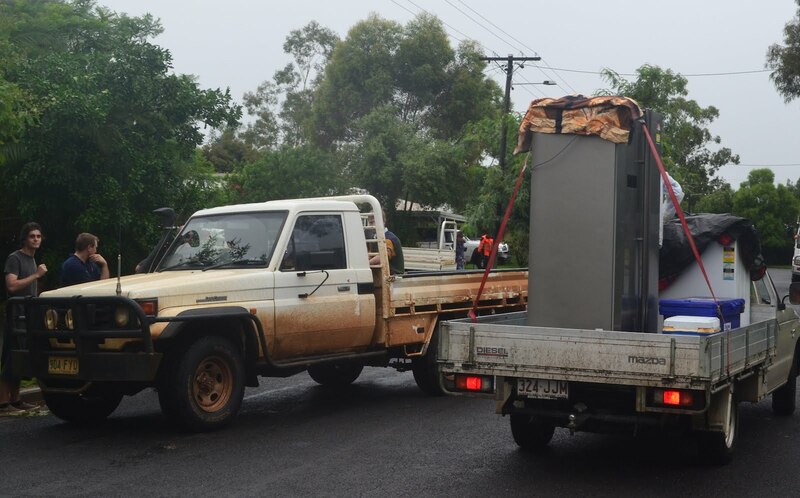 An evacuation centre was set up at the RSL Complex at the western edge of town. 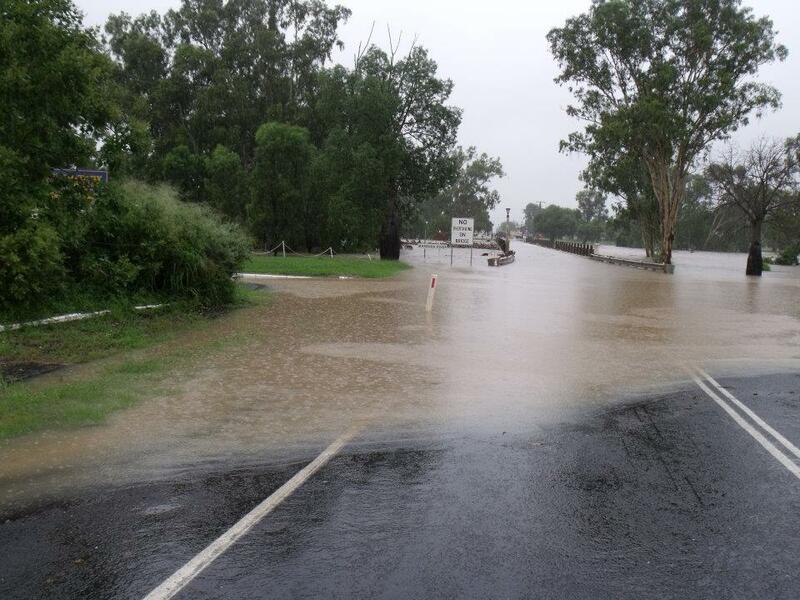 Mitchell was cut off and with heavy rain still falling, the water reached 8.75m at the Mitchell Bridge at lunchtime. Fifteen homes had water over the floorboards with another 40 to 50 houses expected to suffer damage in a peak of 9m (0.8m higher than 1990). 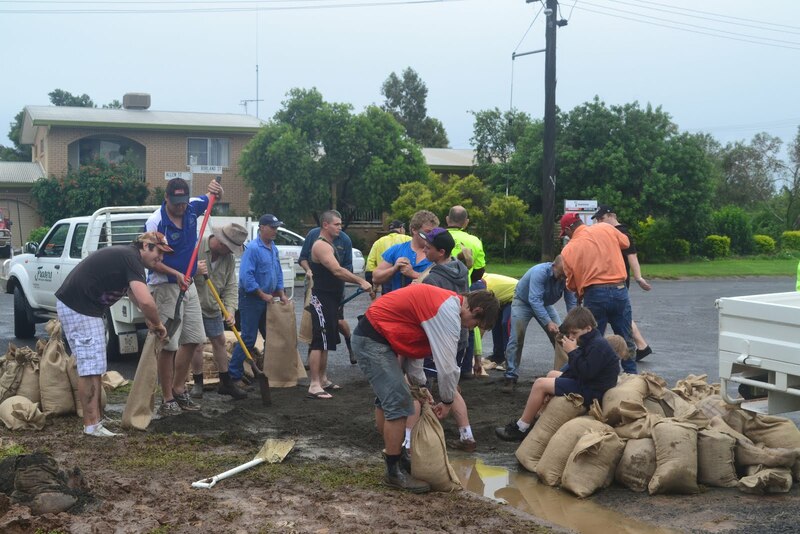 With more rain and water still to come down from Currawong the Disaster Management Group, worried the RSL would be cut off from the rest of town, made the decision at their 2pm meeting to move the evacuation centre to the Council Depot immediately. This is another Deb Maiore photo. 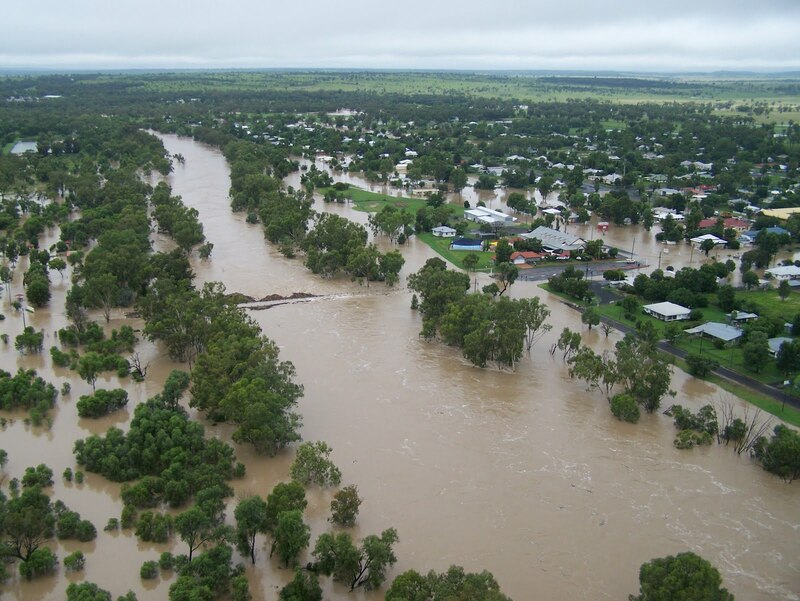 This final pic is from Maranoa Regional Council showing the extent of the flooding from the air (not sure what time). Mitchell is to the right of picture, the river to the left and the camera is facing south. While the river gauges have been steady since around 4pm, rain is still falling heavily (as here in Roma). Local grazier and upcoming council election candidate Kent Morris told us there was heavy rain upstream this afternoon. 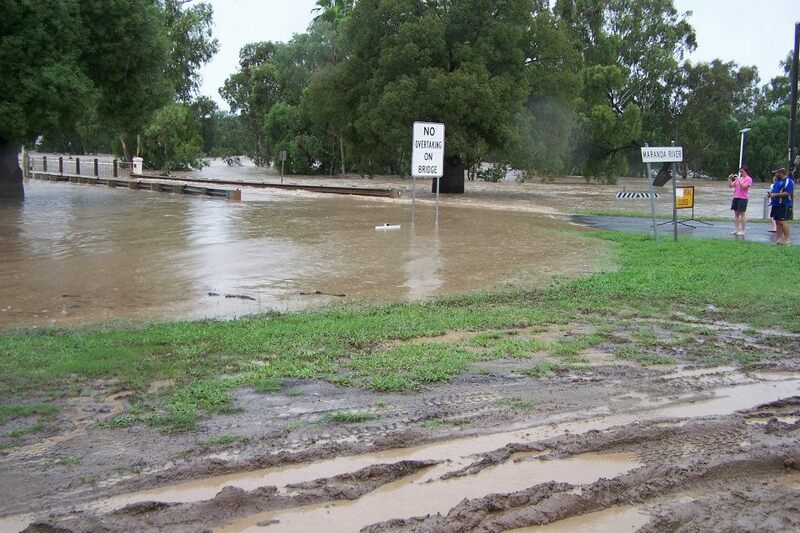 “The river is rising again at Currawong tonight, expect to see the Maranoa start rising again around 11pm,” Kent said. The worst may not be over. It could be a long night ahead. and Mitchell holds its breath as to what will happen next. Downstream at St George could be in trouble too, especially when the waters from the swollen Balonne (via Surat) add to the mix. I’ll find out more at the 7am disaster management meeting.